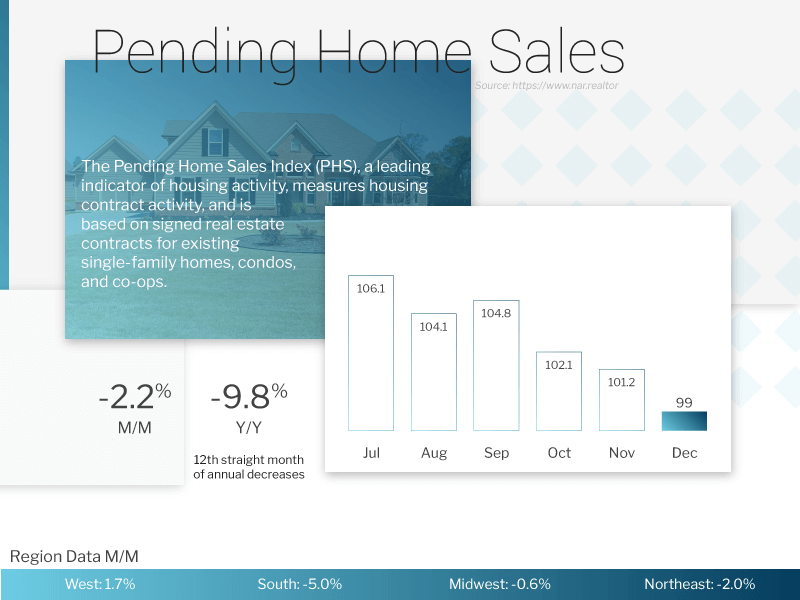 By Todd Abelson NMLS #180858 on February 4, 2019 . The stock and bond markets both saw gains this week fueled by mostly favorable corporate earnings and economic reports plus an unexpectedly dovish monetary policy statement from Federal Reserve Chair Jerome Powell following the Fed’s two-day FOMC meeting. The Fed decided to hold interest rates steady, as widely expected, but investors were encouraged by the policy statement that removed all reference to further rate increases, suggesting the Fed will likely wait at least until June before taking any further action with interest rates. 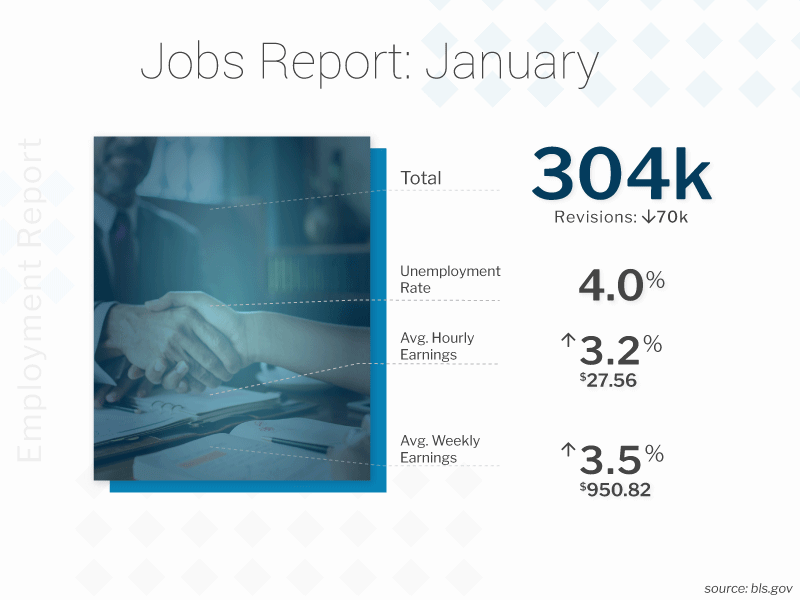 The week’s major piece of economic news was the January Employment Situation Summary (Jobs Report) and it widely exceeded analyst expectations. January nonfarm payrolls increased by 304,000 versus a consensus forecast of 160,000. December nonfarm payrolls were revised lower to 222,000 from 312,000, but November nonfarm payrolls were revised higher to 196,000 from 176,000. Even with revisions that reduced total job gains in November and December by 70,000, job gains have averaged an impressive 241,000 per month over the last three months. The January unemployment rate was 4.0% versus expectations of 3.9% but this was a reflection of more people entering into the workforce. The labor force participation rate was 63.2% in January versus 63.1% in December. January average hourly earnings were up 0.1% after increasing 0.4% in December. Over the last 12 months, average hourly earnings have risen 3.2% versus 3.3% for the 12 months ending in December. 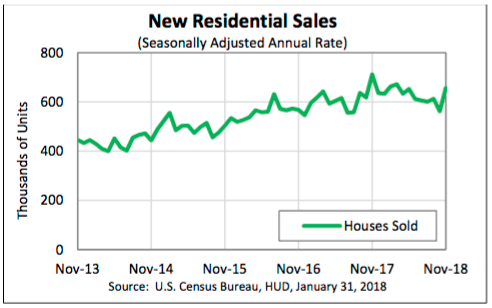 In housing, the National Association of REALTORS® (NAR) released their December Pending Home Sales Index (PHSI) showing Pending Home Sales fell at year-end with contract signings lower by 2.2% from November and down 9.8% from the same period a year ago. On an annual basis, contracts have been on the decline for 12 months straight. 18.5% month-over-month, and 46.3% year-over-year, in the Northeast, and were down 22.1% month-over-month, and 16.7% year-over-year, in the Midwest. Sales were down 7.7% month-over-month and 11.6% lower year-over-year in the South, and were down 3.2% month-over-month and 1.3% lower year-over-year, in the West. At the October sales rate, there is a 7.4 months’ supply of new homes for sale, which is the highest supply level since January 2011. The median sales price in October was down 3.1% year-over-year to $309,700 while the average sales price was up 0.3% to $395,000. As for the latest mortgage data from the Mortgage Bankers Association (MBA), the weekly mortgage applications survey showed the number of mortgage applications decreased from the prior week. The MBA reported their overall seasonally adjusted Market Composite Index (application volume) decreased 3.0% for the week ended January 25, 2019. The seasonally adjusted Purchase Index decreased 2% from a week prior while the Refinance Index decreased 6%. Overall, the refinance portion of mortgage activity decreased to 42.0% from 44.5% of total applications from the prior week. The adjustable-rate mortgage share of activity decreased to 7.9% of total applications from 8.3% the previous week. According to the MBA, the average contract interest rate for 30-year fixed-rate mortgages with a conforming loan balance increased to 4.76% from 4.75% with points increasing to 0.47 from 0.44 for 80 percent loan-to-value ratio (LTV) loans. For the week, the FNMA 4.0% coupon bond gained 37.5 basis points to close at $102.047 while the 10-year Treasury yield decreased 7.4 basis points to end at 2.684%. The Dow Jones Industrial Average gained 326.69 points to close at 25,063.89. The NASDAQ Composite Index added 99.01 points to close at 7,263.87. The S&P 500 Index advanced 41.77 points to close at 2,706.53. Year to date (2019) on a total return basis, the Dow Jones Industrial Average has added 7.44%, the NASDAQ Composite Index has gained 9.47%, and the S&P 500 Index has advanced 7.97%. This past week, the national average 30-year mortgage rate fell to 4.53% from 4.61%; the 15-year mortgage rate decreased to 4.12% from 4.17%; the 5/1 ARM mortgage rate remained unchanged at 4.40% while the FHA 30-year rate decreased to 4.18% from 4.20%. Jumbo 30-year rates decreased to 4.35% from 4.39%. 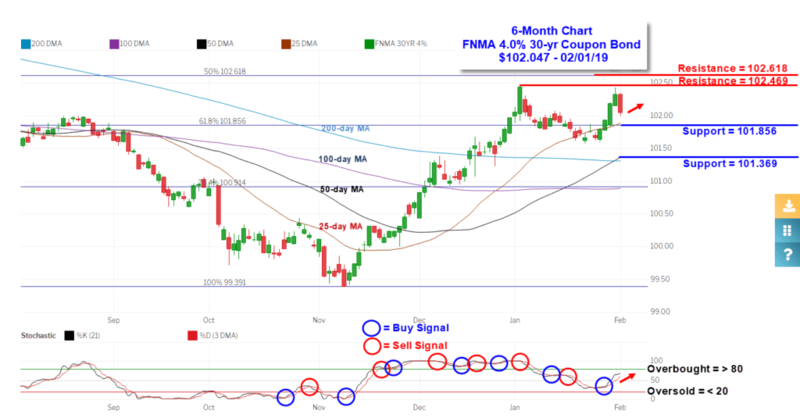 The FNMA 30-year 4.0% coupon bond ($102.047, +37.5) traded within a wider 82.9 basis point range between a weekly intraday high of $102.438 on Thursday and a weekly intraday low of 101.609 on Monday before closing the week at $102.047 on Friday. Mortgage bond prices traded higher Monday through Thursday before encountering resistance and selling off on Friday following a much stronger than expected January jobs report on Friday. A dovish monetary policy statement by the Federal Open Market Committee and Fed Chair Jerome Powell on Wednesday was a catalyst for a decline in longer-term bond yields, with the yield on the benchmark 10-year Treasury note falling to its lowest level in nearly a month on Thursday. From the technical chart, bond prices this coming week should trade between support found at the 61.8% Fibonacci retracement level ($101.856) and resistance at $102.469. The bond is not overbought so we could see a rebound toward resistance levels following this past Friday’s reaction to the jobs report. Trading between current support and resistance levels with a bias toward slightly higher prices should result in mortgage rates holding steady or moving slightly lower.